Some of the news on the economy has become more mixed of late, raising some questions as we look ahead. For example, the latest take on fourth quarter real GDP growth was downgraded to 2.2 percent. That was revised from an earlier 2.6 percent estimate, and marked a slowdown from solid growth of 4.2 percent in the second quarter 2018 and 3.4 percent in the third. And the U.S. Bureau of Labor Statistics’ February jobs report was underwhelming. For good measure, recent reports on manufacturing point to either slowing manufacturing growth since last summer (see the Institute for Supply Management (ISM) manufacturing index) or a decline in manufacturing output during the first two months of this year (according the Federal Reserve’s measure of industrial production). 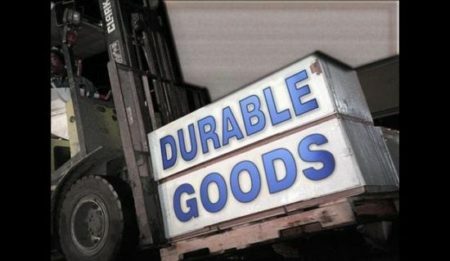 On April 2, the Census Bureau released its latest durable goods report, which raised more questions about business investment. Business investment has been the key driver of economic growth since the start of 2017. At the start of 2017, it was like a light switch was flipped on regarding real nonresidential (i.e., business) investment in the GDP data. In particular, the broad categories of equipment and intellectual property investment have experienced solid growth for the past two years, and that includes a nice bounce back in the fourth quarter 2018 after some slowing in the third quarter. In terms of investment, capital goods orders suffered in February, with new orders for capital goods in general down by 5.9 percent; nondefense capital goods off 6.3 percent; and defense capital goods down by 3.4 percent. It’s important to focus on the change in nondefense capital goods excluding aircraft orders, as it serves as an important gauge of private investment in equipment and software. For February, these new orders declined by 0.1 percent, following on a gain of 0.9 percent in January (revised up from the earlier estimate of 0.8 percent), and a decline of 0.8 percent in December. 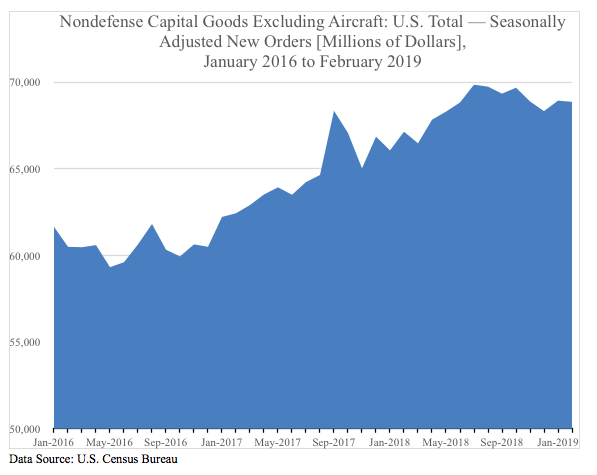 As noted in the following chart, nondefense capital goods excluding aircraft orders grew solidly from the start of 2017 up to the summer of 2018. Subsequently, there has been a slight decline. The hope is that recent questions that have popped up in the economic data will amount to blips along the road to continued and strengthening economic growth. The key for future economic growth is getting the policy right. The December 2017 business tax relief and reform still matters, and is a positive in the business investment equation. The same can be said for the regulatory relief achieved by the Trump administration during the past two years. Working in the opposite direction, though, are the trade tariffs that have raised costs and uncertainties. There has also been a significant increase in federal spending (a 4.8 percent in FY2018, followed by a projected 5.6 percent increase for the current FY2019 budget and 4.3 percent for FY2020, as noted in the Trump administration budget); as well as uncertainty swirling around monetary policy. Keep in mind that the basic recipe for economic growth has not changed, i.e., low taxes, a light regulatory touch, restrained government spending, free trade, and sound monetary policy focused on price stability.